I fear that I have been granted indirect superhero powers over inconsequential people and things. I sports hated on the anti-American leftist druggie Maradona and within one month; he has one of the worst coaching performances in World Cup history, humiliates Argentina’s leftist president, visits with his 2nd favorite dictator who is actually having a worse month than Maradona given that his support of FARC was exposed at a recent OAS meeting — see Vargas Llosa article — was dumped as Argentina’s coach and now, in the most predictable ugly ending since one of Rev. Wright’s parishioners declared his candidacy for the presidency, Maradona has now turned on those who gave him the opportunity for which he was not qualified and did not deserve. You’re traveling through another dimension; a dimension not only of sight and sound, but of mind. A journey into a wondrous land whose boundaries are that of imagination. That’s a signpost up ahead [thanks to the ADA Act of 1990, signposts are now enano-friendly], your next stop, … the Quinque-Cocal drug treatment center, in Holguin, 470 miles (750 km) east of Havana. So who or what to focus on next? Dear Marlins ownership…. ESPN article referenced is copied in full at end of post. On the 26th July, workers from all walks of life took to the streets of Buenos Aires for a political march to mark the 58th anniversary of the death of María Eva Duarte de Perón, better known outside Argentina as Evita. It was fitting, in a way, that the same date was ultimately the day that sealed the fate of one of the few Argentines who can match (or exceed) Evita for popular mass appeal. Diego Maradona’s reign as Argentina manager officially ended on Tuesday the 27th, but the damage was done the day before. Julio Grondona, the president of the Argentine FA, engineered the decision to suit his own ends, having finally lost patience with Maradona’s turbulent managerial style. Whether the news has been reported in your part of the world as Maradona quitting, Maradona being sacked, or whatever, make no bones about it; he was pushed. And there’s no better boss in the world at pushing his staff out than Julio Humberto Grondona. In thirty-one years in charge Grondona has been the only public official of any description in Argentina to remain in office through military dictatorships and the change to democracy which brought governments of all colours to power. What’s more, he’s remained close to all of them. And he’s done so without ever sacking a manager. Diego Maradona’s contract expired on the 30th June. That his contract talks only happened on Monday was partly his own fault. Whilst AFA directors were unimpressed with the World Cup campaign, Grondona wanted to renew Maradona’s contract even against the wishes of his own board. Next year the elections for the presidency of the organisation are coming up, and Grondona seemed afraid of the political fallout should he be the man to sack the greatest and most adored figure in the history of Argentine football. The events of the last week or so have changed Grondona’s opinion somewhat, though. One reason for the delay in the meeting to discuss Maradona’s new contract was that Diego took a flight to Venezuela to meet his good friend Hugo Chávez, rather than stay at home to talk. During the delay, though, he did help some form of “dialogue” along. He phoned up a TV chat show, and made his position clear; “If they even touch the kit man,” he told the panel, “I’ll walk.” According to Maradona himself, Grondona’s opening gambit in the contract talks when the two met a couple of days later was, “first of all, the kit man’s got to go”. Maradona has somewhat hoist himself by his own petard in many ways, then. It wasn’t only his words on that chat show – El Show Del Fútbol – that helped his bosses get rid of him. A prominent panellist on the show is Oscar Ruggeri, a man who’d never been a TV personality before this year. Ruggeri was the man Maradona had wanted as his assistant, but whom Grondona put his foot down over and wouldn’t allow onto the technical team. His solution? Ruggeri got a job as a TV “journalist” and, when he travelled to South Africa in that capacity, was the only journalist Maradona allowed in to “watch” the squad train. Not only that, but the network Ruggeri works for – and therefore the network Maradona phoned to give his exclusive bargaining plea to – is TyC Sports, the cable company. Some readers might remember them from this time last year, when the Argentine championship was delayed by a week as Grondona, backed by the government, tore up the TV contract with TyC in order to re-sell the broadcasting rights to the state-owned channels. Ever since, TyC have been heavily critical of the AFA. Maradona’s choice of media outlet seemed calculated to irritate his employers. It would also have irritated the Argentine government. Like the governments of Chile, Paraguay and Uruguay (all of whom enjoyed much better than expected World Cup campaigns), Cristina Fernández de Kirchner, the Argentine president, invited her national team’s manager and any players who were still in the country to attend a function at the presidential residence in Buenos Aires for a photo opportunity. After the side had been welcomed back to the country with an outpouring of support, it seemed a great chance for her to pick up a few votes by gladhanding. 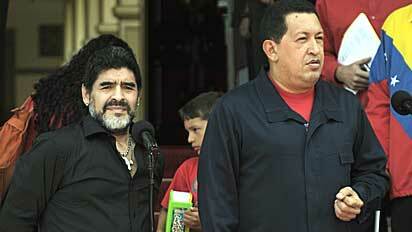 But her invitation was flatly ignored by Maradona, and instead Chávez was the first president he met after the World Cup. After supporting him publicly for so long, Cristina suddenly began to feel that Maradona perhaps wasn’t such a great vote-grabber after all. With Grondona also tiring of him, this was only a matter of time. And following Maradona’s televised declarations, the job became simple for Grondona; ever the Godfather figure, when he finally got Maradona at the meeting on Monday, he simply made him an offer he knew he couldn’t…um…accept. So what next? Favourite for the job is Estudiantes manager (and former Sheffield United and Leeds playmaker) Alejandro Sabella, but if he stays with his club then Diego Simeone, Miguel Angel Russo, or youth team coach Sergio Batista could all come into play. Maradona, meanwhile, has offers on the table from the Mexican national team and Napoli, if rumours are to be believed. Whilst Grondona hasn’t come out of this looking all that good, Maradona has at least remained true to himself; a press conference on Tuesday evening saw him continue to defend his back room staff to the hilt. The quote on all the t-shirts that’ll be on sale in central Buenos Aires by Wednesday afternoon was this: “Grondona lied to me, [national team co-ordinator Carlos] Bilardo betrayed me.” Maradona’s looked out of his depth a lot of the time, but the men running the side might yet find that their biggest mistake, in the long run, was putting themselves in a situation which pitched them against one of the greatest folk heroes their country has ever known. And we’re not talking about Evita. This entry was posted in Random Observations and tagged Twilight Zone, World Cup. Bookmark the permalink.